Join us for an unforgettable full day’s trip to one of Norway’s most unique nature attractions: Folgefonna (Buer Glacier), located only 5 km from Odda. The day trip offers an exciting river traverse on the spectacular trekking route towards the glacier. 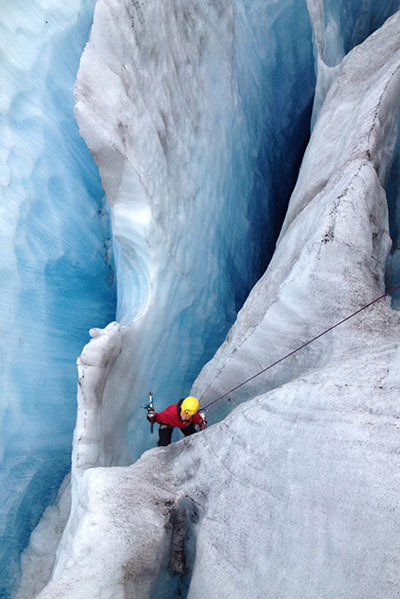 While walking on the glacier you experience the magical blue ice, and for those who like an extra challenge it will be possible to try ice climbing in the magnificent crevasses. The glacier trip is conducted by trained instructors using special equipment. So if you want to remember your holiday to Norway by a lifetime nature experience this will be it ! The trip takes place in Folgefonna National Park (the Buer Glacier), located only 5 km from Odda. We meet at Odda Camping to gather the group and from here you follow the guides to the parking place in Buer where the hike starts. Please note you have to drive from the meeting piont to Buer Valley (5 km) in your own car. Ask for our Packing list for this trip when you book. Duration: Day trip, appr. 8 h.